May 18, 2014: Definitely a most worthy game! Today Kramnik was able to win his game multiple times do to inaccurate play on both his and Ponomariov’s part. I am in shock that the same Kramnik that missed 19.Qxh7+ played such a precise endgame. Thanks to Ponomariov, Kramnik was able to pull ahead of Anand and is now in first place all by himself. 15…Rg8 This is where Anand deviates from game three. In game three Anand played 15…Bd6 and 16…Rg8. In game five he reverses the order. 17. Bg3 Had kramnik played 17.Bxd6 Qxd6 18.Rfd1 e5 19.Rxd4 Qxd4 20.Nxd4 Bxg2 and Anand would have been able to repeat the position for a draw. 18. Rfc1 Kramnik had several interesting alternatives including my choice of 18.Nxd4 f4 19.Nxe6 fxe6 20.Qxe6+ Kf8 21.Qf5+. 18…f4 This is the reason why Anand played f5. 22. Ra3 Kramnik misses the critical 22.Bxd7 Kxd7 23.b4. 27. Re1 Kramnik’s other choices of Rd1 and b4 deserve a second look. 27.Nxd4 Qxd4 28.Rd1 Nf6 29.Rxd4 Nxg4 30.Rd7+ Kf8 31.Rxb7 Rc1+ 32.Bf1 does not need explanation. 29…Nxd4 Kramnik blunders and looses the game. 29.Nd2 d3 30.a5 Rс2 31.Bxd7 would have been preferable. Kramnik’s chances of winning the World Championship may have just evaporated. 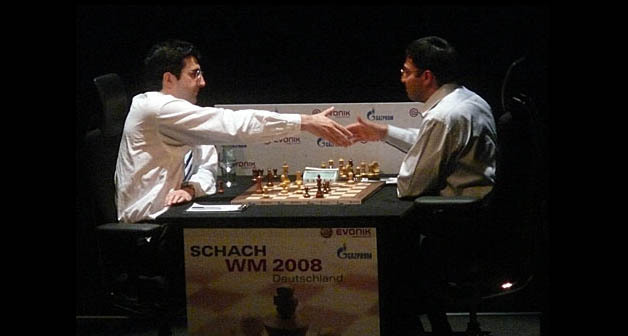 This years chess match between Viswanathan Anand and Vladimir Kramnik takes place 150 years after one of the greatest world championship matches in history. In 1858, the two best chess players in the world, Paul Morphy and Adolph Anderssen, battled in Paris to determine which player was the greatest. When Morphy arrived in Paris to play Anderssen, he was stricken with a severe flu. His medical treatment was typical for the time period and included being leeched and drained of four pints of blood. 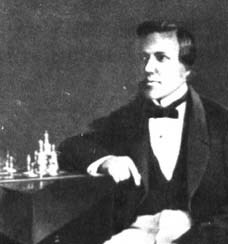 Paul Morphy was so weak that he played the match from his hotel bed. Despite the disadvantage of playing while ill, Morphy won the match with a 7-2 score. Many chess writers refuse to admit that Morphy was the world champion. The logic these writers use to deny the fact is rooted in their attitude of European supremacy and is easily refuted by chess historians. Below are the games from the match. If you are an improving chess player who has not seen these chess treasures, you have your homework. It was back to the “drawing” board in game 4 from Bonn, Germany. 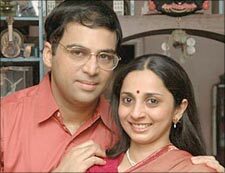 Defending champion Viswanathan Anand played the white side in the solid Queen’s Gambit Declined. Kramnik ended up with the ubiquitous isolated queen’s pawn and allowed Anand no opportunities for victory. 3. Nf3 Anand decides to avoid a repeat of game 2’s Nimzo-Indian. 6…Nbd7 Kramnik does not play 6…c5 which would have lead to more exciting play with higher winning chances for both players. 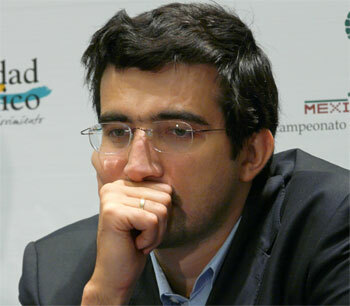 Perhaps after yesterdays loss kramnik just hoped to escape with a draw. Another possibility is that Kramnik still plans on playing for a draw every game he is black. 11…Bf5 Kramnik plays a rare move rather than the thematic 11…Bf6. 15…Qxf5 Kramnik has obtained an equal position. 18…Nc5 Kramnik makes a good choice. 18…d4 is tempting but after 19.Qxb7 dxe3 20.fxe3 Qxe3+ 21.Kh1 Ng5 22.b4 Anand has a favorable position. 21. Rd4 Many of my esteemed colleagues preferred 21.Rac1 Rad8 22.b4 Ne4 23.Qd3. 21…h5 Kramnik is trying to get his knight to e6. 24…g4 Finally Kramnik can get his knight to e6. 26…Ne6 Now Kramnik can play d4 and exchange his isolated pawn. 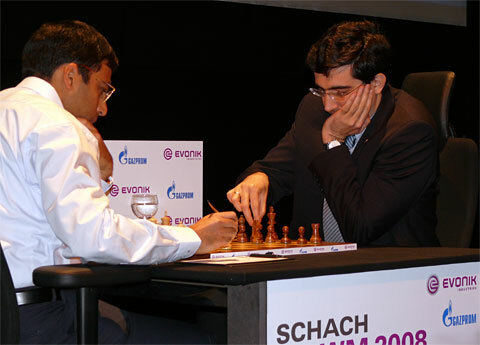 Kramnik faced off against Anand in Game 1 of the World Chess Championship Match on October 14, 2008. 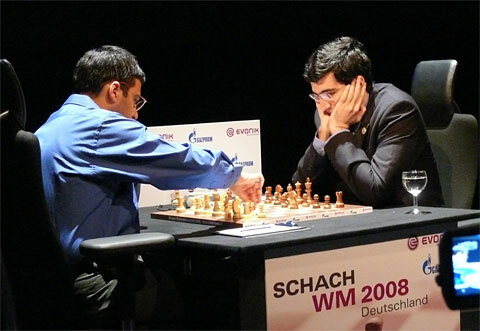 The “Battle of Bonn” began with little surprise as Anand chose to play one of his main weapons referred to as the Slav Defense to the Queen’s Gambit Declined. The game concluded after move 32 when a draw was agreed to. 2… c6 Anand chooses to play the Slav. 4. cxd5 Kramnik decides to use boxing strategy. Rather than go for a knock-out in the first round, Kramnik feels his opponent out and takes little risk. This move also gave Kramnik little chance for a win against Anand as the resulting positions tend to be very symmetrical and drawish. 9… 0-0 Anand breaks symmetry but continues along the well known Slav Exchange mainline. 11… Rc8 Anand avoids the trouled pawn weaknesses occurs should he have played bxc3. 12… Ng4 Anand does not play Ne4 13.Qa3 bxc6 because it would lead to problems for Black due to the weakened pawn structure. White was victorious in Ivanov vs. Torres Los Angeles, 1992 when play continued 12…bxc6 13. Rc1 c5 14. 0-0 Ne4 15.Qa3 f6. 14. Qb4 To my knowledge this is an original idea by Kramnik. Previously, 14.Qa3 Rxc6 was played in the game Reynaldo Vera and Ivan Morovic-Fernandez in 2002. This idea can be risky for white if play continues 14.Qa3 Rxc6 15.Qxa7 Qe7 16.O-O Rfc8. 14… Rxc6 I believe this was the best move of the game. Black takes the file and avoids the previously discussed pawn weakness. 14… bxc6 15.Bd6 would also leave Kramnik with a much better Bishop. 16… Rfxc8 For the sacraficed pawn, Anand gets two very active rooks and control of the open “C” file. 17… a5 Anand stops Kramnik from playing b4 and moves a weak pawn closer to wear it can be traded. 21. e4 Kramnik attempts to create some counter play. 25. Bxe5 Kramnik finally improves his Bishop. 25… Rxa2 Anand gets his sacrificed pawn back. A position such as this between players such as these will produce a draw. 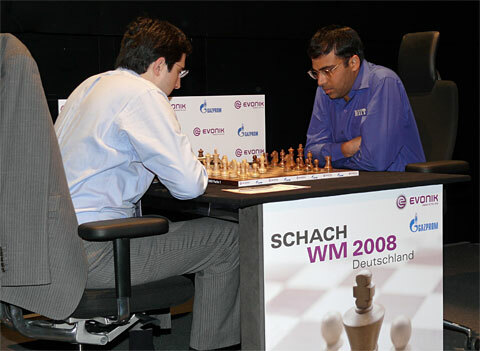 Kramnik began the match cautiously while Anand spiced up the game with a pawn sacrifice leading to significant initiative which in the end was enough to secure the draw.